There are times when having a network of neighborhood branches takes on a whole new meaning. That’s certainly the case in Flint, Michigan — as Enterprise employees have been pitching in with a neighborly effort to address the current water crisis. The city of about 100,000 people has been operating under a state of emergency since early January, due to lead contamination that rendered its water supplies unsafe to drink. 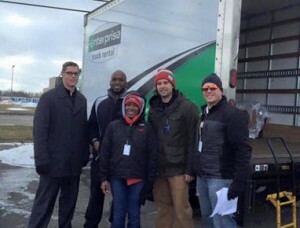 To make bottled water readily available for residents, Enterprise teamed up with Michigan Allstate Agents and The Legacy Group Water Project in a statewide collection and distribution effort. It all came together for the first time in mid-January when the Flint branches welcomed five incoming 16-foot box trucks—loaded with more than 20,000 bottles of water. Volunteers from Enterprise, Allstate and other organizations then distributed the water door-to-door, as well as to convalescent homes, shelters and community centers. But that’s just the start: Participating Allstate agencies across Michigan will continue accepting donated cases of bottled water through April, when the water supply issue is expected to be resolved. Until then, Enterprise teams will shuttle the donations to the two Flint branches on a bi-weekly basis for distribution to local residents. According to Patti, a special tip of the cap for spearheading the effort goes to employees at the two branches in Flint, along with Area Rental Managers Tom C., Scott I. and Antwan J., Logistics Supervisor Kristen K. and Branch Rental Manager Steve C.